Maybe Sherilyn is just not ready to be off diapers when she naps during the day. A few days ago, she went upstairs to her mah mah’s bedroom and napped with her. My mil had forgotten to put a plastic sheet under Sherilyn. I was busy with Baby C. I had wanted to go up to ensure that the plastic changing mat and plastic sheets are all laid but Baby C was fussing and I had soon forgotten all about it. In fact, I have been so consumed with Baby C’s daily feeding and cleaning regimen that I have neglected my 2 older girls quite a bit lately. I’ll blog about Baby C’s tedious regimen of feeding her antibiotics, probitiotics, cranberry juice and other supplements later. An hour later, Sher came downstairs and as usual, announced to me nonchalantly “mummy, my shirt is wet...” My maid had to carry the daytime-napping-mattress down and out to the porch to have it washed as it was soaked with stinky pee. 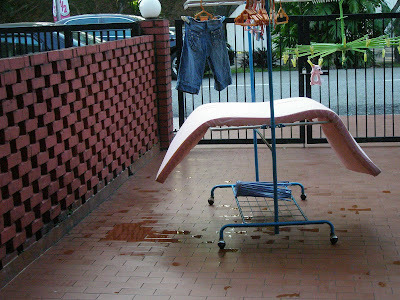 The mattress that was just washed, hanging in the porch. After this pee accident, I told myself that maybe Sher just ain’t ready to be off diapers during her nap. Though many times I had brought her to pee half-way through her nap, she would still pee in her pants later. The pee accidents and cleaning up part are really draining me out….. and I am already very very frazzled with Baby C’s daily feeding and cleaning regimen. So with a white flag, I regressed and put a diaper on Sher again during her naptime on days when I feel too exhausted to wake (and drag/force her up from bed!) Sher up to pee. Drying & cleaning the wet mattress due to pee is what i hate most. That’s why evry night (or rather morning around 12 midnight & 4am) I would wake up & carry my Juliana (4) and Jasmine(3) one after another like a sleeping zombie to he potty to avoid having to take the heavy mattress out to dry. Good exs for mommy & good exs for their bladder training. Thk God they have not been wetting the bed now for more than 2 months oredi. At certain days when it’s cold, i would expect them to have the pee accident and I would use the “Febreeze: spray..emm just love the smell & no hazzle to dry the mattress if it’s just a small wetting. yeah..dont pressure yourself. i guess when the times come, sher will be out of diapers soon. yeah, don’t stress yourself. When sher is ready to go diaper free in the afternoon, she will. my baby is 20 months now and i used to dread all the potty training (as so many people nagged me to do it) but since her pediatrician said not to stress, baby will decide when she’s ready, i’ve slacked in my efforts and basically just don’t bother about it for now. right… don stress yourself and sher out.. Maybe try to stress how smelly/dirty her backside is when she pee-d on the diaper??? Since young, I have been telling my girl how smelly her backside and dirty the pee/poo, then eventually she dont want to wear it. mayb u wanna try getting those underpads for her during afternoon nap. thats what i used to do with my kids. good luck! I too can’t take off the nappy during naps. Just too much work!